Return a musical instrument to its owner. Reunite a minstrel with their precious lute. 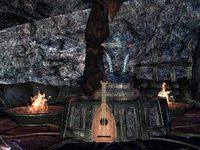 I found Minstrel Idria's lute abandoned in the Grotto of Depravity. Find Minstrel Idria at The Shining Star. I should try to return the lute to its owner. If you decide to track down the owner, Idria's Lute will appear in your inventory. Now leave the delve and start looking for Minstrel Idria. You may have already met her in the tavern in The Hollow City when she marked the Grotto's location for you on your map. So head to the city and enter The Shining Star where Idira will be standing against a wall, and go and speak with her. "Did you find my lute? I feel almost naked without it." "You found it! How wonderful! Oh, I missed my lute, F'lah, so much! Oh, thank you! I feel so happy. I think I want to play a song. Oh, F'lah, let's make some beautiful music together!" She will then give you a small amount of gold and the Battle Minstrel's Mantle. Finishes quest I should try to find Minstrel Idria and return her lute. This page was last modified on 17 January 2019, at 02:03.